My weekend officially started Saturday afternoon (woohooo!) and naturally I couldn’t be happier to have this last day before work tomorrow! We had a ton of work to do around our house this weekend but decided to take yesterday “off” and spend most of the day walking around antique stores and ended up seeing American Shooter (amazing and intense movie!). Since we bought our home last June (I will post on that huge project this week) we have been spending every free second on projects. We were able to design our home as it was a new build and this came with many pros and some cons that we weren’t necessarily expecting… but I will touch on that this week. Overall we couldn’t be happier and love this big ol’ house we call home. I absolutely love to cook and consider it such an act of love to cook for my husband and our families! So of course the kitchen is my favorite room of our house and it’s been such a joy of mine to really settle into this space and make it ours. The day we moved, the kitchen was all unpacked (with help from my step-mom and mother-in-law) and in proper working order… it is my perfect space! The kitchen on the night we moved in… so much has changed and been added making me fall more in love with it everyday. Love this cute cutting board my brother-in-law and sister-in-law got us for Christmas! 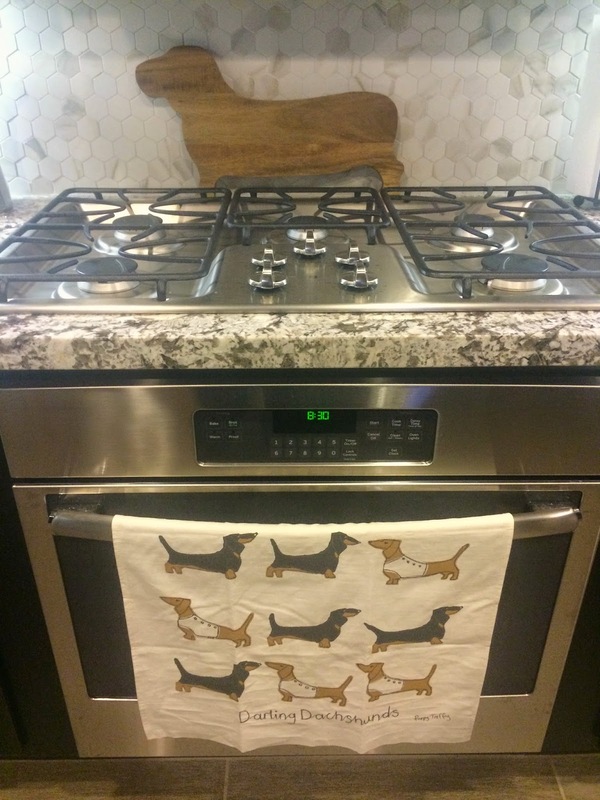 Matches our wiener dog towel! Our new little coffee (&& tea) corner of the kitchen.. I love this little space! One of my favorite parts of our kitchen is the connection I feel with my mom when I’m in it. She was such a homemaker and absolutely loved to cook. I’d always be so amazed because I could open the pantry and see nothing to eat and 10 minutes later she’d have a delicious meal made. I know it gave her such joy and I’m so grateful for the memories I have with her that revolve around the kitchen. In fact, one of my last memories with my mom was her showing me how to cut a pineapple… random, I know, but so so special! Isn’t it awesome when something so simple is such a huge reminder of something so sweet? !